Have you ever wondered what lipstick is made of? This post outlines the most common ingredients currently used in popular lipsticks. Additionally, we examine the history of lipstick formula, and the upcoming future developments in the lipstick industry based on the academic literature. 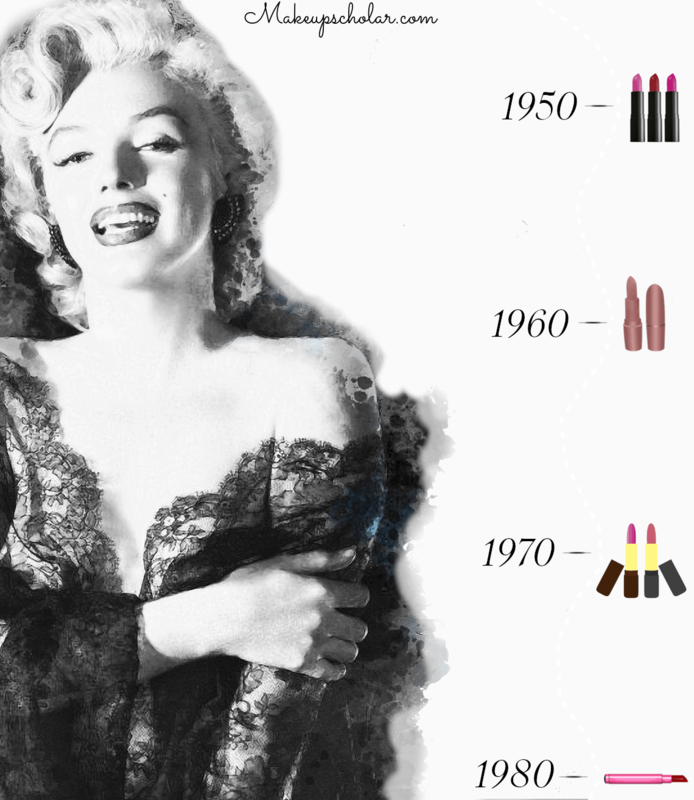 Keep reading to learn the present, past, and future of lipstick formula! ♥ Is Modern Lipstick Vegan? In the past many harmful ingredients were used to pigment lipsticks. Poisonous chemicals like mercury, arsenic, and vermilion are no longer used in formulas (thankfully!). Eosin and tetrabromo fluorescein commonly provided color pigment, and have now largely been replaced by oxides like aluminum and barium lakes. Because we haven’t discovered a single ingredient to cover all of these bases, lipstick is formulated with a range of different ingredients – mostly a blend of fatty materials & oils (emollients), waxes, and pigment for color. Additionally, lipsticks include preservatives to help them last, and fragrance for a pleasant smell. The basic element lipstick ingredients haven’t changed much at all throughout history (which is fairly rare for a cosmetic product!). Most noticeably cochineal extract and carmine are still popular for pigment, but the formula has definitely improved. Innovation and trial and error has improved the quality of lip products dramatically over the centuries. Mastering the base and ratios of ingredients is at the core of this enhancement. Instead of using just one type of wax, oil, and emollient, now developers mix several together to economise on costs and create better performing lipsticks. The wax in the lipstick gives it its shape. In the past, pure beeswax was used. Now a combination of carnauba and beeswax (or sometimes candelilla) is the norm. Carnauba, while more expensive, is a good addition because it melts at a higher temperature than the beeswax – meaning your lipstick is less likely to turn to liquid in the heat. Beeswax has also been improved since in the 1990s. ‘Ultrabee’ (a brand name) makes lipstick application better, more transfer proof, and prevents the lipstick bleeding on the lips. Emollients (and oils) are protective agents that help evenly disperse color and moisturize the lips. When emollients are designed to evaporate quickly after application, it creates a lip stain for a long lasting (but sometimes drying) effect. Oils can provide an antimicrobial and moisturizing effect. Typical oil additions include vegetable, mineral, or caster oil. Scientists have discovered that some traditional oil ingredients in large doses – petrolatum and lanolin oils, present allergy risks and contamination risks respectively. Therefore, modern lipsticks now contains a much higher ratio of castor oil. In addition to the traditional castor oil, esters, and lanolin – modern emollients also include moisturizers, collagen, sunscreen, and aloe vera. The added nylon microspheres helps the lipstick color adhere to the skin and moisturize better than the previously used water. In the last 25 years, fluorescents have also been added to lipstick to for a shiner texture and deeper color. Most lipsticks are NOT vegan. Beeswax (which a lot of vegans avoid) is often used as the wax base. Carmine (crushed bugs) are included in most red or pink lipsticks. Lanolin oil is another common lipstick ingredient – derived from sheep sebaceous glands. Grossed out? Fear not! Certain brands have vegan ranges. The Urban Decay’s Sheer Revolution, Too Faced Melted Liquified, and LUSH liquid lipstick lines are vegan & cruelty free, and PETA approved. Lipstick is the most common cause of allergic contact cheilitis (an inflammation around the lips). It results as a hypersensitive reaction after exposure to an allergen – often from one of the ingredients in lipsticks. Eosin was a huge cause of allergic contact cheilitis in the early to mid 1900s, however it’s rarely used in lipstick today. Because carmine can cause allergic reactions, the FDA require a label on most cosmetic and food products with carmine declaring its inclusion. Many of the oils used in lipstick can cause contact cheilitis. Ricinoleic acid (included in castor oil) is a common cause. Lanolin, olive oil, coconut oil, and almond oil are also known to trigger this allergy. Additionally, vitamin E and propylene glycol can cause allergic reactions – watch out for them on the ingredients list. 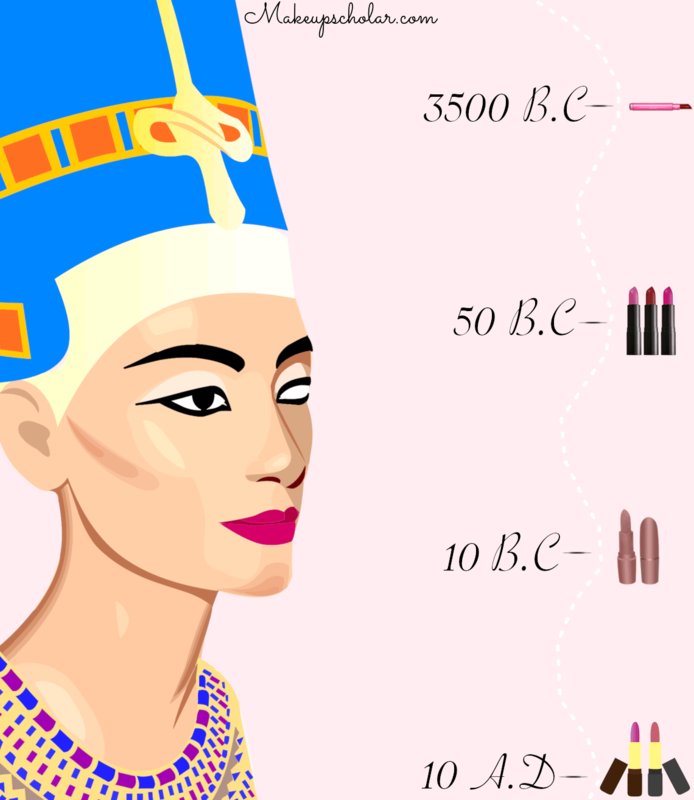 The use of lipstick can be traced back to Circa 3,500 B.C. with the Sumerian Queen Schub-ad in Mesopotamia. The Queen coated her lips with a mix of white lead and crushed up red rocks. Excavations of Mesopotamia reveal the rich were buried with cockleshells containing lip paint. Lip paint was worn both both men and women at this time. When lipstick use spread to Egypt, it was also used by both sexes – more of a wealth signal than a gender expression. Egyptians made and perfumed their own lip paint at home in wooden or brass makeup kits, completely free from any government regulation. In ancient Egypt, lips were rouged with red ochre (a type of clay), that was ground up and mixed in with water. This was applied with wet wood sticks. While orange, blue-black, and magenta were also popular shade options, red was highly fashionable. The elites of 50 B.C (including Cleopatra) popularised the use of carmine as the main red dye in lip paint. Carmine comes from ground remains of pregnant cochineal insects. In ancient Greece, lipstick was worn primarily by ladies of the night – who used wine, red dye, and some more unique ingredients like human saliva, crocodile waste, and sheep sweat! Because it acted as a signal for this kind of work, regulation of lipstick use (but not regulation of ingredients) began. Eventually, the popularity of lip paint rose with the higher classes. This higher end lip paint contained less gross ingredients – vegetable extracts (seaweed, mulberries), plant roots, but also commonly included a not so safe ingredient – vermilion. During the period 150-31 B.C, lipstick use rose in popularity with both sexes, and once again acted as a signal of high status. Copying Nero’s wife, women in Rome applied purple or red lip paint using iron ore and ochre. Much like Mesopotamia’s and Greek’s use of lead and vermilion respectively, rich Romans also used a dangerous, potentially deadly poison called fucus in their lip paint concoctions. The poor, who relied on red wine instead, did not expose themselves to this poison. In the 10th century Al-Zahrawi wrote a medical encyclopedia called Al-Tasreef. As he considered cosmetics as a branch of medicine, he included a chapter solely on the topic of cosmetics – discussing incense, aromatics, and perfumes. This encyclopaedia was later translated and spread to the West. At the time, adhan, an oily substance, was used to beautify. Stocks were perfumed, rolled, and pressed in dedicated moulds – and these are believed by some to be the earliest forms of modern day lipstick. Safflower petals were crushed in Japan to make lipstick, which was applied to the edges of the lips. Lip makeup was not uncommon during this era in Northern Europe. Several Irish texts refer to red lips achieved with the help of herbal dyes. Religious institutions began heavily criticising the use of lipstick during the Middle Ages, especially in England. A light tint was permissible – women would tint their lips with crushed up red roots or sheep fat. A more opaque lip came back into fashion with Queen Elizabeth 1’s coronation. A huge fan of lip paint, the Queen made her own crimson shade with fig milk, egg whites, gum Arabic, and cochineal. The lip pencil is thought to be invented by either the Queen or her entourage. Plaster of Paris or ground alabaster was mixed with a coloring substance, and rolled into a crayon like shape. Lipstick during this era became so fashionable that it was not uncommonly used instead of cash as a means of exchange. Ironically, many at the time believed it had magical healing powers. In actuality, it contained a harmful substance called ceruse (white lead) as the main ingredient. The use of lipstick was later regulated by the English parliament, with a law declaring that using makeup to coax a man into marriage punishable as witchcraft. 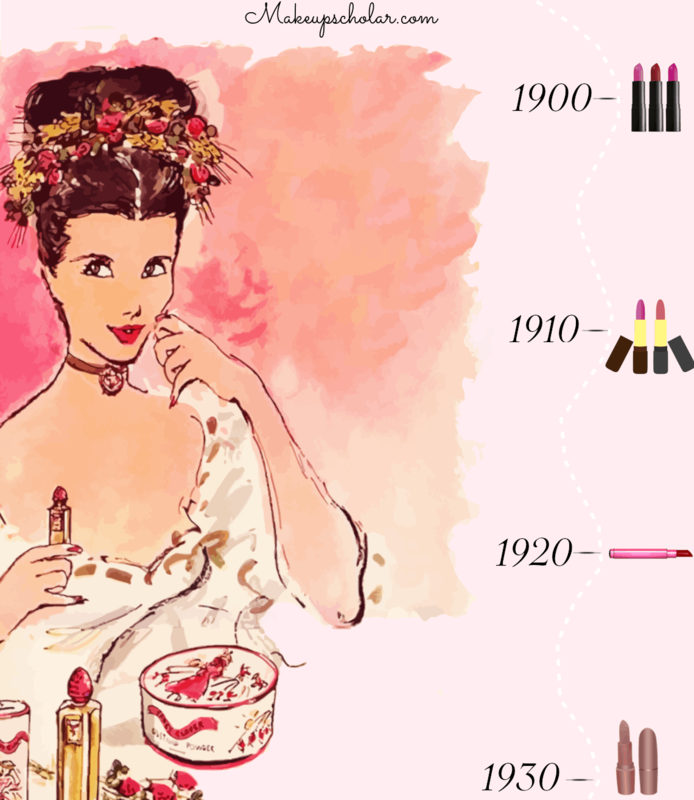 During the reign of James 1, lip color was a signal of class due to the difference in cost of ingredients. Lower classes stuck with the traditional, less expensive ochre red made from cheap and dangerous ceruse. The higher classes could afford bright cherry red, composed of less toxic ingredients like animal fat, which was imported from abroad. In the 1700s, older women made their own lip paint, and some of the most wealthy had rooms dedicated for this purpose. They typically used popular or family recipes – some of the ingredients included wax, ox’s marrow, alkanet, and white pomatum. Fancier recipes involved mixing roses with hog’s lard, or adding gold leaf as a finishing touch. A simple lip tint was achieved by rubbing brandy on the lips until they turned red. A 1724 Act banned medicines or concoctions made with certain harmful ingredients in London. Some of these banned ingredients were commonly used in lip paint at the time. In the American colonies, women used creative methods to rouge their mouth. Some rubbed red ribbin on their lips, other sucked on lemons throughout the day, alternatively they rubbed Bavarian Red Liquor on their mouth. Martha Washington liked to apply a concoction of almond oil, balsam, raisins, sugar, wax, spermaceti, alkanet root, hog’s lard, and wax. During the Victorian Age in England, the legal prohibition of lipstick led to a rise in black markets and homemade rouge. Some just bit their lips to turn them red, others secretly added carmine to lip chap. The richest of the rich would smuggle in Guerlain’s lip pomade (made of butter, wax, and grapefruit) from Paris. Meanwhile, the first makeup counter at a department store opened in the US in 1867 at New York’s B. Altman. In the same year, Harriet M Fish patented rouge made from hollyhock root, strawberry juice, beet juice, and carmine. Lipstick was both a feminist symbol for those in the suffragette movement, and used for beautification by others. Advancements were made when the first synthetic carmine was developed – improving lip shades. Guerlain were the first to create a lipstick in tube form. Soon the word ‘lipstick’ to describe lip makeup became the norm. At the time, American lipstick consisted of beeswax, olive oil, and crushed insects. Alternatively, lipsticks were made by mixing lard with pigmented powder. These formula combinations had incredibly short lifespans – turning rancid in just a few hours. Inventions in this decade included lipgloss and the first attempts at long lasting, waterproof formulas. While strides were made in innovation, many lipsticks still contained dangerous ingredients like coal tar dyes. Lipstick became a symbol for the women’s rights movement yet again, and flappers adopted lipstick for shock factor. Innovation in the lip product industry began ramping up. Lip liner and sun protection lipstick became popular. Manufacturers designed multi-functional cases for lipstick, invented new, shinier lipstick finishes, and added heavy amounts of perfume to lipstick for a two in one product. In 1933 a New York senator attempted to regulate the use of cosmetics. He learned that that a depilatory cream called Koremlu contained a harmful substance – thallium acetate, which was poisoning people. The Food, Drug, and Cosmetic Act was eventually passed in 1936. The act stated that cosmetics could no longer contain any “poisonous” or “deleterious” elements in dangerous amounts. The industry got creative with packaging in the 1940s. During the war era, lipstick packaging was often disguised as binoculars, or sometimes carried useful accessories like flashlights for blackouts. Max Factor released the first truly long lasting lipstick ‘Tru-Color’. A lot of formula development happened in the 1950s. Big brands tweaked their formulas to make them more comfortable on the lips. Levels of carnuba, beeswax, and bromo acids were cut to help reduce the drying effect that the previous formula produced. Shimmering lipsticks were a hot trend. Mostly unknown to the consumer, these were made from animal excrements. Liquid lipsticks were also in vogue. White lipstick was another new fad, with the white color produced by titanium. In 1958 the Food Additive Amendment was passed, imposing a ban on colorants in cosmetics with links to cancer in humans or animals. The frosted lips trend continued, but the fish scale and waste ingredients were replaced with titanium dioxide, iron oxides, and mica. Lipstick manufacturers also started including baby powder and baby oil in their formula. The biggest advancement in formula, however, was the addition of spectrophotometer to the coloring process. This resulted in a better color range and a more uniform batch of each shade. Lipstick production began to be viewed as an exact scientific process by the industry as the Food and Color Additive Amendments came into effect. As a result, manufacturers had to be more careful with ingredients. The number of colors used in makeup production began to fall dramatically as a result. The FDA put forward a series of regulations that were challenged by the cosmetic industry – some successfully and some not. The disco fever era warranted glossy, dark lips – so the industry began flaming lipstick (running the lipstick through flames at an ultra quick speed, causing the lipstick to melt on the outside and harden as shiny). The natural look was also in, especially in the feminist movement. Costumers increasingly demanded cosmetics made with natural products. Lipstick manufacturers developed their lipsticks using plant extracts, flavoured their formula with natural products, and focused on the alleged medicinal benefits of lipstick in their marketing campaigns. The FDA required a full list of ingredients labelled on cosmetic product packaging. Sperm whale oil was commonly used in cosmetics (including lipstick) up until the 70s, however the FDA banned its import to the US in the late 1970s. Jojoba oil acts as a good substitute for sperm whale oil – with the added bonus that it doesn’t contain triglycerides, and it doesn’t have sperm whale oil’s fishy scent. Further regulation came into effect – color delistings, self-regulatory practices at an industry wide level, and new legislation in certain US states. For example, greater emphasis was placed around regulating cosmetics with carcinogenic or toxic chemical ingredients in California. A harmful ingredient – hydroxyanisole was taken out of lipstick in 1983 because it removed pigment from the lips. Brands focused on perfecting their packing – even getting the ‘click’ closing sound perfect. Glow in the dark lipstick became a novelty for a short period of time. It was banned by the FDA because the glow was created from zinc sulfide (an unapproved color additive). The natural trend was back, with many brands marketing vitamin and herb ingredients. Some marketing campaigns hinted at hemp in their formula helping to give a high or mellow out wearers. The FDA ended its ‘adverse reaction reporting’ policy, but largely left the self-regulation and self-report system intact in the 1990s. This system operates via industry wide ingredient tests and voluntary reporting. Many US states passed environmental regulations in the 1990s that impacted the lipstick industry – with a heavy emphasis on recycling and waste management. Innovations continued into the 2000s, with a heavy focus on creating long wearing and transfer-proof technology. A discussion of transfer proof lipstick even reached elite scientist levels. The Nobel Laureate, Pierre-Gille De Gennes described the difficultly with developing a transfer proof, but soft and smooth finish formula. He discussed the creation of a transfer proof lipstick with block copolymer that transforms to a gel when it meets saliva. A significant issue with lipstick packaging in the modern era is waste. Squawkfox estimates about 2 dollars worth of each CoverGirl Nature Luxe lip balm is wasted due to shoddy packaging! Hopefully brands will develop more efficient packaging in the future – for the sake of both the consumer and the environment. Lipstick is one of the cheapest cosmetic products to produce, and also one of the most popular makeup products among consumers. Rest assured – we can expect a ton of innovation in this lucrative market in the future. It’s difficult to predict the future of innovation in the world of lipsticks cosmetics completely, but recent research gives us a hint of what’s to come. Even though harmful ingredients were used in the past, most lipsticks today are safe to use. However, the ingredients evolution is continuing. Soon our lipsticks will contain ingredients that are not only harmless, but also have health benefits. Scientists have experimented with acylated and nonacylated anthocyanins as the colorant in lipsticks. Anthocyanins are pigments naturally found in many foods (giving food a rich color), and provide antioxidant effects. They are typically used in herbal medicine. Anthocyanins also have reported anti-cancer, anti-inflammatory effects and help to fight free radicals. Another study investigated the antioxidant effect of purple yam anthocyanins used as pigment. While placing the anthocyanin into the lipstick weakened the antioxidant effect of the anthocyanin, it was still present when added to the lipstick. Some recent lipstick inventions haven’t really taken off – did you know a vibrating lipstick was patented in 2004? In 2016, a patent application was submitted for a lipstick tube that works by a pushing or pulling action, with a lid operated control unit so there’s no need to worry about the lid falling off. A recent study investigated the feasibility of a 3D printed personalised lipstick application, moulding to exact shape of lips – removing the need to use a mirror when applying this lipstick. Only time will tell if these tube and 3D print innovations can dominate the lipstick market in the future. In 2007, there was a scare in relation to lead found in lipsticks. Even with the leaps and bounds made in terms of lipstick safety, we must be cautious and consumer aware. Some researchers have assured that a customer would need to eat 1000s of lipstick tubes in order to develop lead poisoning. As a result, consumers have demanded more natural and safer lipsticks to ensure they’re not ingesting any harmful ingredients. Researchers have developed herbal lipstick by combining castor oil, paraffin and bees wax, beet root juice, Shikaki fruit powder, lemon oil, orange essence, and vanilla essence. Another paper examines the efficacy of a herbal lipstick made using essential oils and plant pigments as an alternative to chemical based ingredients. Not only is this herbal lipstick safe – it also has health benefits, freshens breath, and prevents lip chapping. PrevPreviousReview: NuMe Megastar Flat Iron – Auto Shuts Off, But Better Than GHD?! Interesting!! I am really obsessed with lipstick, glad to know what lipsticks are made of. It’s great you have such an extensive article outlining the past of lipsticks, but more importantly the future of lipstick! In the end, it’s important what we put on our skin and in our body. And your site is helping trail blaze the industry through sound research and academia! Thank you for that!! Thanks so much – that’s a huge compliment coming from you! Absolutely love your work on Amazingy.com. Have been asking myself about this for sometime now. Thank you for the simple yet interesting answer to this. Much appreciated. Next is mascara.